Located on the western tip of the Hawaiian island of O‘ahu, Mākua has long been a place of refuge for Kānaka Maoli, native Hawaiians. a place where we Hawaiians can still be free."" One of the last undeveloped valleys on the island, Mākua has become a home for the houseless, the unemployed, working poor, drug addicts, victims of domestic abuse, the sick and those that simply want to live the Hawaiian lifestyle of their ancestors. With the upper valley used as a gunnery range by the U.S. military, beach residents struggle to survive in the blistering sun, relentless wind, salt spray and pounding waves. Nevertheless, they prove they can solve their own problems, build their own living spaces, grow food, share labor, clear industrial waste and trash, and even police themselves—all without big government programs and money. 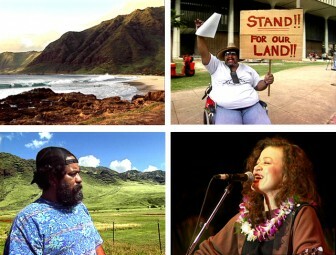 This documentary was produced to try to ward off a threatened eviction by the state of Hawai‘i. The eviction finally took place in June of 1996. A 1983 eviction at Mākua was also documented by Nā Maka o ka ‘Āina, Mākua Homecoming. David Henry Rosa, Sparky Rodrigues, Leandra Wai, Virginia Bernard, Reggie Crawford, Kaimana Kyle, Joseph & Keoni Victor, Barbara Avelino, Sia Vaana and Eddie Keo.